It all started simply enough. Jasper wrote a post (An Amazing Choice) about a young man, Marshall, with cerebral palsy. As typical for him, Jasper piece was insightful and thought-provoking. At the end of the piece, Jasper offered his readers the opportunity to contribute to his post. Having the opinion that there can exist such a thing as a Gift of Suffering does not dimish the hardship that suffering brings with it. Do not misunderstand me, please. suffering is not a preferred way of life, but it can change us into more compassionate, patient, thoughtful, kind, loving, enthusiast, insightful, creative, and respectful people. There are other ways that these attributes can be added to our lives, but disabilities have a way of hurrying along the process. Again, do not misunderstand me, please. I am not saying that if you have a chronic illness, you will automatically join the club of those who have found the secret of being content with their situation. It is a choice – always and daily. Jasper made that choice. An essential concept in design theory is the use of negative space: the area around and in between the subject matter. Basically, the idea is that what you leave out is as important as what you put in. For example, if I decided to paint a landscape, the spaces of sky and the deep shadows help support the shape of the trees. Even though the object (the positive space) is what people tend to notice, the negative space is what keeps the eye moving through and around the painting. The cooperation between the positive and negative spaces make the painting continually engaging. The same can be said of the mind. This past month, I found myself on an unexpected journey of fascinating concepts about the fundamentals of my beliefs. As I struggled to examine my mindset about God, love, humility, relationships and suffering, I become acutely aware that I needed to challenge my every thought. My mind moved through negative space where I struggled to write for I could not articulate the inner quest. What I held as foundational was as important as what I did not hold as foundational. The question What is left out? kept my mind engaged. As I transitioned from being the object to being the space around the object, I found myself on the precipice of reorientation of assumptions and beliefs. Having a disease is just a physical condition under which I function. My suffering is not the object in my life’s painting; it is the negative space which helps to frame my portrait. My image is not only in the likeness of God, but I share that image with all of humankind. When I suffer, others suffer; and, when others suffer, I suffer. In our suffering, we share our humanity; just as in our joy, we share our humanity. The negative space around each person paints a picture of how they are joined to the next person. In return, they then become the negative space of the next person. Each one of us is the object and the non-object. Let us begin to experience the world through our neighbor’s eyes; let their sorrows be our sorrows and their joys our joys. 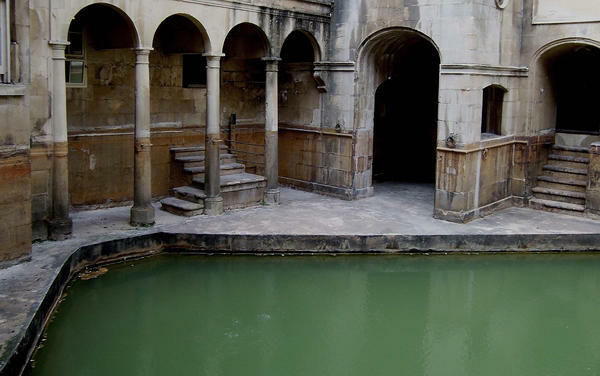 I was standing at the very edge of a pool – the kind used in ancient days – a healing pool. Suddenly, children were walking toward me. Each one reaching out a hand for me to pull them out of the water. They ranged in age from 2 years to 18 years old. As I grabbed them, they stepped aside and stood behind me. No one spoke – not even me. With the last one lifted out of the water, her hand in mine, I turned to survey the sea of children. The older ones held little ones in their arms. We all understood that each one was responsible for the other. But, I knew that ultimately I was to care for all of them. Somehow, I needed to find a safe haven. They needed food and clothes and a place to stay. How can I feed all of them? I wondered. There must be at least a hundred children. Flowing together, I lead the river of lives as we streamed down the crowded streets. Even now, we made no sound. Not knowing where to go, I wandered – each step with the weight of a hundred souls. As if it were the line from a psalm, the words How can I feed them? kept cycling in my mind. Winding our way through unknown streets, I became disoriented, but the children continued to follow me unheeded. Where will these children be safe? I can’t take care of them. Look at how the older ones care for the younger ones. What am I going to do? We came to a clearing – a piazza akin to the kind in Rome. At the far end stood a Cathedral. I headed there. Certainly, they will help me. As I drew closer, the lines across my brow disappeared, and I smiled at the children nearest me. I nodded my head in the direction in which we were headed, for an orphanage stood 300 yards away. Nuns dressed in the traditional habits worn in the 1960s or earlier stood in the courtyard of the orphanage. Brushing dirt from her skirt as if the swiping action of her hand could remove the stains from a garment that had been worn beyond its useful years, one of the nuns approached me. Her clear, brown eyes scanned the children and came to rest on me. “Good afternoon,” she said with a voice as pure and clear as her eyes. “I understand.” As I reached out my hand in farewell, she closed the short distance between us and hugged me. The embrace felt natural as if she were my sister, and I hugged her in return. Then, I pulled back and looked once more into her eyes. She understood, also. No words were necessary. Turning away from the orphanage, I noticed the faces of the children. They calmly stood before me, waiting to follow. They understood, too. They always had. “We have not found home, yet. Let’s continue onward,” I called out to them. They said nothing in return. Their silence was a comfort to me. It was at that moment that I knew that my search was over. There was no other place for them; they were my children. Hadn’t I pulled them out of the healing pool?